For 25 years Edward has been mentored and has apprenticed with Zerka T. Moreno, who with her late husband J.L. Moreno, created a form of action-therapy called psychodrama. Within psychodrama Zerka pointed Edward to study the existential practices for healing oneself, groups, organizations, and society. He began his professional work at the Department of Psychiatry at Harvard Medical School where he designed, developed, and then implemented a treatment program for opioid addicted adults. He later did the same in Burlington, Vermont; and at the Boston Living Center, an outstanding organization serving people living with HIV and mental health and addiction challenges. Edward has traveled to Romania, Germany, Canada, Spain, Italy, and Portugal teaching “the social and sacred microscope” which is at the core of Moreno’s work, as a training and educational process to awaken the individual and the group to the creativity and Intelligence made manifest within the group and individual. 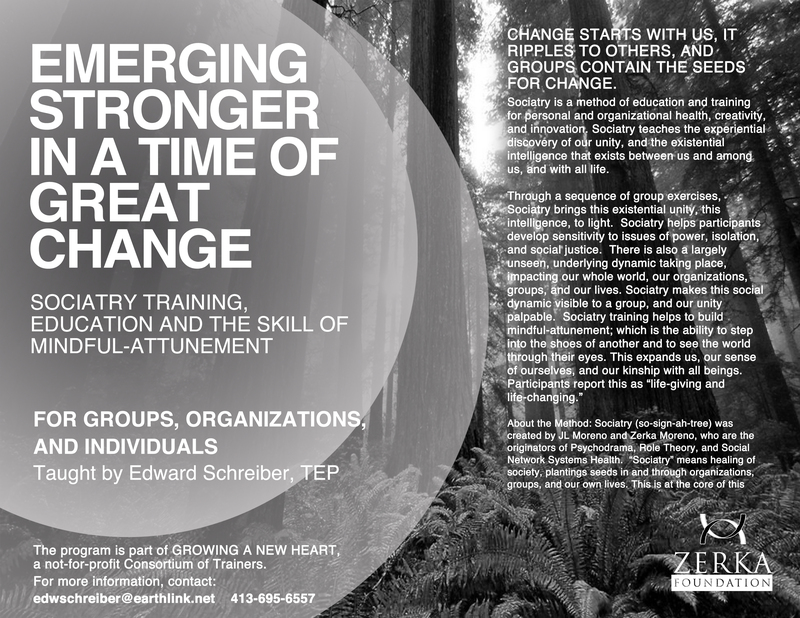 This “awakens the autonomous healing center” within self and groups — and plants this awakening in the social fabric of organizations, groups, society, and oneself. Edward is the author of the chapter on psychodrama, sociometry, group therapy, and society for Kaplan & Sadock’s Comprehensive Textbook for Psychiatry. He has served on the faculty of the International Association of Group Psychotherapy and Process Academy in Granada, Spain. He is co-editor of The Quintessential Zerka, Writings by Zerka Toeman Moreno on Psychodrama, Sociometry, Group Therapy; and editor of her final book To Dream Again — a Memoir. He is the recipient of the American Society of Group Psychotherapy and Psychodrama’s Scholar Award, and is a Fellow of the organization. Essential to Edward’s life and work is his unyielding position for addressing the social and economic marginalization of individuals, and the natural world, as an “underlying dynamic impacting all of humankind” as JL Moreno described it. His work is dedicated to reversing and healing this dynamic, so the full embrace of all life can be realized.